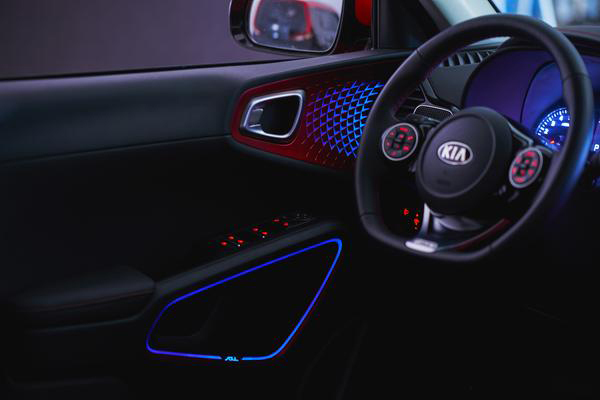 Soul Booster, the next-generation Soul compact crossover, will bear smart interior lighting system “Sound Mood Lamp” when it becomes available in the first quarter in Korea, its producer Kia Motors said Friday. The Korean automaker focused on the effect of music and interior lighting to make passengers feel more comfortable in the new vehicle, it added. The new lightings system changes the lighting in tune with the background music. Advanced razor etching technology is applied to lightings on inside door handles for subdued colors. The Sound Mood Lamp will offer six color themes with eight mellow lighting modes. Drivers can connect the lamp and sound systems on the car infotainment system. Soul Booster also is equipped with other high-tech multimedia systems including 10.25-inch HD display and Bluetooth multi-connection system.